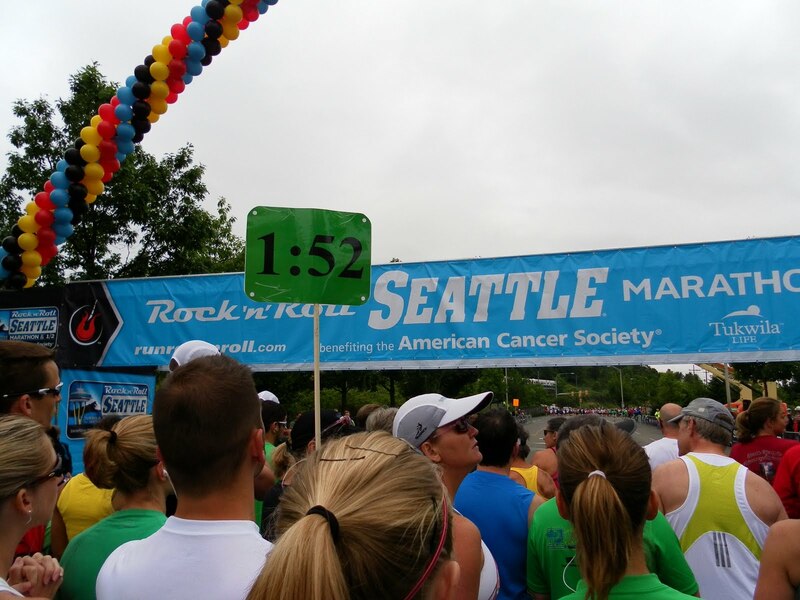 Views from two wheels: Seattle Rock n Roll Half Marathon - Lucky #7? Seattle Rock n Roll Half Marathon - Lucky #7? Now it was just minutes from the start. I didn't bring any music, and since no one was feeling very chatty, I spent the last moments stretching and thinking about whether I was ready to tackle this time goal. 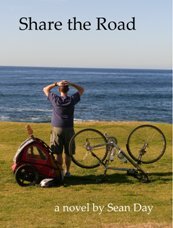 I was not fully trained, but I felt like I had enough miles on the road in the past couple of months to give myself a shot. But a week at home with friends and family made me feel five to ten pounds heavier. And I wasn't too sure how well the wine and a short night sleep were going to sit on my system. My current best time at a half marathon was 1:55:36 recorded at the Bellingham Bay Marathon in October of 2008. I ran another half a couple months later in Seattle, and was only 30 seconds slower. I have been running on a semi-regular basis since then, and have improved both my 5k and marathon times, so I thought I could meet or improve my PR. The pace group I chose was for a 1:52 finish time, which I though was about perfect - an improvement, but not a huge leap I hadn't put in the training for. After the Star Spangled Banner (always gets me), the gun went off around 7:00am. Each corral of runners were sent off separately with about a minute of space in between. This is a great way to do things as it eliminates much of the log jams at the start and enables runners to get into their pace relatively quickly. Since I was following a pacer, I didn't have to concern myself with speed and just had to play follow the leader. At about mile 1, there was an inflatable guitar player sponsored by Brooks. Brooks has teamed up with the Rock n Roll series, and the long-legged archway was on the San Diego course as well. One of the bloggers I follow has also teamed up with Brooks running, and she was at the expo on Friday. I stopped by, but missed seeing her there, but I did catch a glimpse of her at the side of the road just before we crossed under the guitar player. Frayed Laces (as she is called on her blog) recently qualified for the Ironman Championships in Kona, Hawaii this year. Whenever I think "I don't have time to train", I read how much she fits in and I remember that I can make it happen. I would check my watch every so often to see if we were maintaining the desired pace, and Tim was like a metronome, never more than a few seconds plus or minus from the desired pace. The course is relatively flat in the beginning, so hitting the pace immediately was not too difficult. I ran in Tim's shadow for much of the way, but would speed up a bit when we reached the water stops. I still prefer to walk for about 15 seconds in order to drink without choking. Tim and others have the drink-on-the-go skill, so I would play catch up after each stop. The day was about perfect for the run, overcast and much cooler than the heat of last year's marathon. Even so, I made sure to pour a little water on my head at each water stop. They also hand out a performance drink (Cytomax) at the water stations, but after one sip, I decided to skip it. It just didn't taste very good, and I didn't think it would sit well on my stomach. After my difficulties in San Diego, I decided to stick to water, a salt packet, and a gel for fuel. The road tipped upward around mile 4, and Tim held a steady pace. It probably wasn't quite goal pace, but it was close. It pushed me a bit harder than I probably would have otherwise, but it wasn't too bad. The thing I noticed the most was that his pace felt slow once we reached the top. I think I typically speed up on the flats after a hill, keeping up the increased effort instead of easing off to rest. By maintaining pace, it felt easier than normal, and I probably kept a little bit more in the tank for later. Miles 6-9 are right along the shores of Lake Washington. The street is tree lined as well, so it is an inspiring place to run. There wasn't a bald eagle this year, but I did see a blue heron gliding above the road. Our pace group seemed to grow as we went along, so if I was running in Tim's shadow it was actually a bit crowded. There were actually two groups running together, as our pace was the same as the full marathoners shooting for a 3:45 finish. After one of the water stops, I pressed ahead just a bit and it was much more wide open. I know he was just on my heals because several spectators would comment, "the 1:52 (or 3:45) pace group is just behind you". The road climbed again around mile nine and I pulled back into the pace group. There was a short, but very steep section to get us up to I-90 and the tunnel into downtown. There was a DJ playing music in the tunnel, but like last year it was blasting so loud it was hard to find the song within the noise. Once I reached the light at the other end, and with most of the climbing behind us, I decided to pick up the pace at mile 10 and see what I had left in the tank. I was feeling pretty good at that point, not great, but in control. The course heads into downtown with great views of both Safeco and Qwest fields. The marathoners had rejoined the course after their out-and-back on the floating bridge, and the 3:15 pace group passed by at a good clip. But I seemed to be passing a good number of the half marathoners on my side of the road. Once we hit downtown, there were more spectators lining the streets, and with the finish line within reach (for the half marathoners), the energy level kicked up a couple of notches. There was one last climb onto the Viaduct, and though I was feeling pretty good, I was really glad I wasn't heading north with the full marathoners this year. Off the Viaduct and back on the streets, we made one last turn for home. The road to the finish is in front of Qwest Field, and it was jammed with folks cheering us on to the finish. I still had something in the tank, so I picked it up for the sprint to the finish line. I crossed in 1:50:35, cutting five minutes off my previous best. It was one of the more enjoyable races I have run, one of the few where I really felt in control, but pushing myself just enough. I probably could have gone a little faster, simply because I didn't feel completely smoked at the end, but the half marathon felt about perfect. I had no reason to expect a PR, especially with the way I have been endulging and not sleeping this week. I am sure I have the pacer to thank for giving me a smooth start to launch off from. I can definitely see using a pace team again in the future. And starting tomorrow, I start to take things more seriously. It feels great to have a good race when you aren't expecting it, but it also makes me excited to show up on race day prepared to do my best. I am training for the Long Beach Marathon in October, and have hopes of participating in a Half Ironman next spring. This will take not only more specific training, but also taking better care of myself away from training. I am definitely due for a detox.